I love body products specially if they will leave my whole skin feeling soft and moisturized which is exactly the case with these two. If you're looking for a flawless glowy skin I'd definitely recommend these buddies to you, let me introduce you to my: Shower Favorites. When I received Dirty Derrik scrub I was really excited because it is a coffee and coconut scrub, I know what you're thinking right now and yes, you're perfectly right, it smell delish! Plus you know coconut is my ultimate favorite. I couldn't wait to get myself in the shower and spread it all over my skin. Must warn you it gets messy, VERY messy, but believe me as soon as I rinsed it off, I was wowed by the look of my skin it was insanely soft, it looked healthy, moisturized and it had this amazing natural glow, I was immediately obsessed, the mess was ''soooo'' worth it! 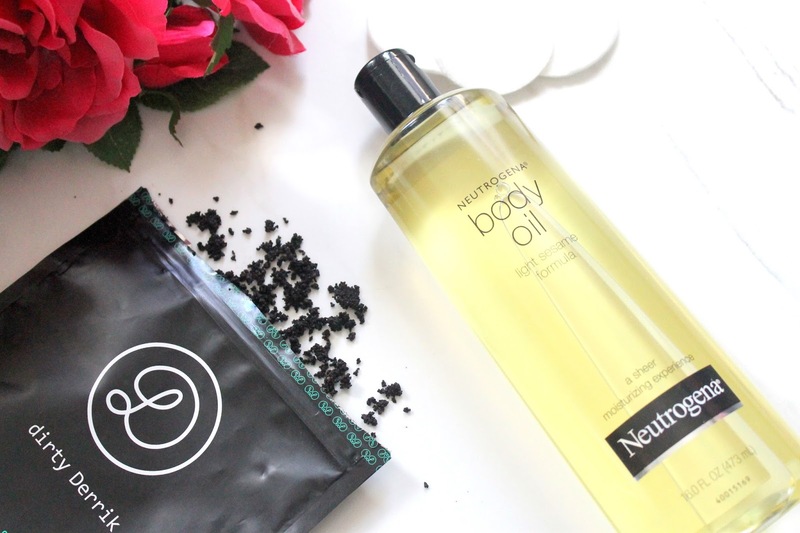 I've been using the Neutrogena Body Oil for a while now, I use it right before getting out of the shower, having my skin still damp I take some drops and spread it very well on the areas I want, which is basically my entire body and I let it dry naturally so the skin can absorb all the magic. It has a nice scent, it's not sticky at all, at least for me, It really moisturizes the skin and also provides that fancy sassy glow to the skin. These are my top two shower faves, what are yours? A mi me encantan los productos para el cuerpo especialmente si estos dejan mi piel sintiéndose suave y humectada y este es exactamente el caso con estos dos productos. Si estás buscando una piel radiante te recomiendo echarle un ojito a estos dos, les presento mis: Favoritos de la ducha. Cuando recibí el exfoliante de Dirty Derrik estaba tan emocionada porque es un scrub de café y coco, sé lo que están pensando y están en todo lo correcto, huele delicioso! Además ya saben que el coco siempre ha sido uno de mis favoritos. No podía esperar a meterme en la ducha y exfoliar mi piel. Debo advertirles que se hace un desastre, un tremendo desastre, pero creanme desde que lo retiré, estaba impactada por como lucía mi piel, estaba increíblemente suave, se veía saludable, humectada y tenía este brillo natural hermoso, me obsesioné inmediatamente, el desorden valió completamente la pena! 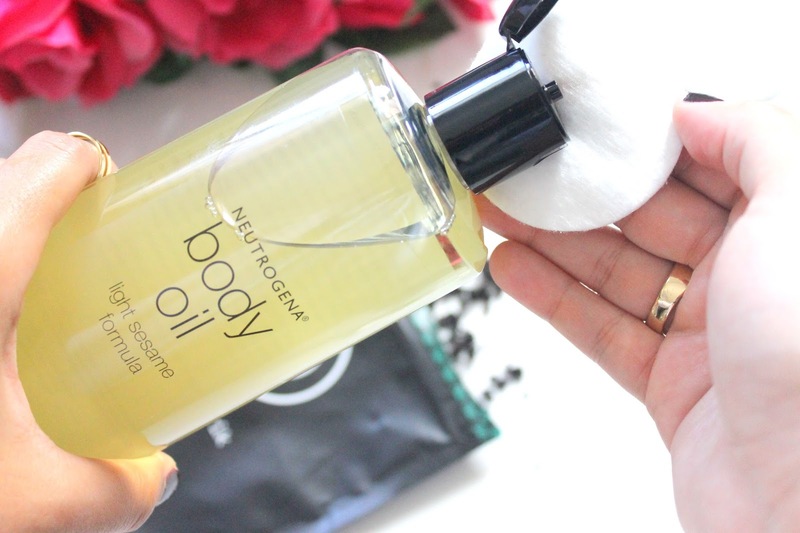 He estado utilizando el Neutrogena Body Oil por un tiempo y lo uso justo antes de salir de la ducha, cuando mi piel aún está húmeda tomo unas gotas y lo distribuyo por las areas que sean de mi interés lo cual termina siendo básicamente todo el cuerpo y lo dejo secar naturalmente para que así la piel absorba toda la magia. Tiene un aroma agradable, no es pegajoso al menos no en mi, deja la piel humectada y to proporciona ese brillo en la piel por igual. Estos son mis dos favoritos en la ducha, cuales son los tuyos? A mi me encanta uno de rosa mosqueta y para el embarazo viene genial! Lo tendre pendiente para cuando me toque, haha!! Good product. I will try this out. Thanks for the post!! Nice article, thanks for sharing a valuable information. I’m extremely impressed with your writing skills as well as with the layout on your blog. Is this a paid theme or did you customize it yourself? Anyway keep up the nice quality writing.. Your Blog is nice and informative,its really useful for me..Thanks for sharing such a wonderful post with us..
Nice article, really enjoyed to read about your article, thanks for sharing your wonderful ideas. Very interesting article! Thanks for sharing this awesome post with us. Looking forward for more posts from you. Regards.